Today I am going to demonstrate how to make a simple tomato sauce. The ingredients you are going to need are one green pepper that has been seeded, cored, and sliced into strips; a little salt; two cloves of garlic; one medium onion that has been quartered; four red ripe tomatoes that have been skinned; and of course, a blender. To start off, place your green pepper strips into the blender, along with the onion. Process until liquefied. Add in the tomatoes, the garlic cloves, and one and a half teaspoons of salt. Kosher salt works really well. And, just puree until liquefied. Once you have your vegetables pureed, go ahead and pour them into a pan over the stovetop. Bring it up to a boil for a few minutes, and then allow it to simmer. This will make the sauce thicker and help develop its flavor. As the tomato sauce simmers, the excess water from the vegetables will start to rise to the top. Go ahead and take a spoon and remove that water. There might also be a little bit of foam, and that can be removed as well. Allow your sauce to simmer until it reaches your desired consistency, and then remove it from the heat and allow it cool. Once your tomato sauce has cooled, you can either go ahead and use it in a recipe, or it can be placed into a freezer container and be stored in the freezer for up to a year. Remember to allow at least a half an inch of head space between the sauce and the lid of the container. Place the lid on your container, and always remember to label and date it. 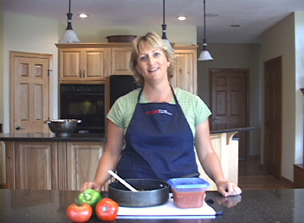 For more information on tomato sauce, visit RecipeTips.com.